Lightweight yet secure, the Master Lock Combination Padlock is ideal for protecting your belongings while travelling or in the home. 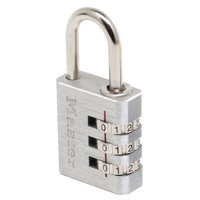 Create your own 3-digit combination and reset it when necessary, or regularly for added security. A solid brass body offers the essential security you need for your personal property. Ideal for a variety of applications including suitcases, gym bags, desk drawers and lockers.